A fine pair of suit slacks helps you look stylish on the golf course. Wearing suit slacks while golfing is usually acceptable at any golf course, but could represent overkill. Dressing up in a fine pair of suit slacks could be perfect for a Sunday round of golf at a swanky private country club, but over the top for a Saturday morning round at your local municipal course where dress codes are likely more relaxed. Use your own discretion in choosing to wear suit slacks for golf. If you feel comfortable playing golf in a fine pair of suit slacks, then go for it. Esquire magazine suggests that you wear slacks that are conservative in appearance. Esquire does not specifically recommend suit slacks, but does suggest dark slacks and a solid polo shirt -- a style made famous by golfing great Arnold Palmer, according to Esquire. Many country clubs and public golf courses post dress code information on their websites. That's helpful if you're headed out for a round of golf at a friend's club and aren't sure how you should dress. Usually, private clubs are likely to have stricter dress codes than public courses The Los Angeles Country Club, an elite private club, posted on its website in 2012 that "men's slacks must be of a tailored nature." That suggests that wearing suit slacks -- or another pair of fine trousers -- is the way to go for that particular club. Playing golf in suit slacks could be more convenient in some situations. The Los Angeles Country Club requires men to wear a sport coat or suit, with shirt and tie, in the club's dining room and some lounges and private function rooms. 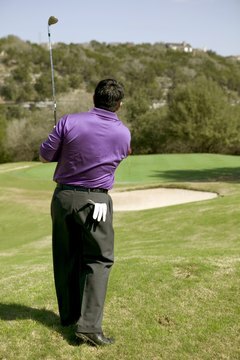 A golfer playing the course in suit slacks could freshen up in the locker room and prepare for dinner with a change of shirts and by adding a jacket and tie. Chances are you'll never be ridiculed for dressing up on the golf course -- and that's another reason to wear suit slacks if you wish. Showing up at the first tee overly dressed is always better than dressing in poor taste. Wearing denim jeans is a no-no at private clubs such as the Los Angeles Country Club, for example. If you're in doubt about what to wear -- even after consulting the course's website -- simply call the golf course and ask for the pro shop. An attendant can tell you how people usually dress at the club while playing. Some special events, such as tournaments conducted by the United States Golf Association, may require players to dress in a certain way. For example, women competing in the 2010 U.S. Women's Amateur all wore khaki slacks. The USGA does not dictate dress codes for private or public clubs, but usually requires smart casual dress for events it sponsors, making suit slacks possibly unacceptable. Check with tournament organizers about the dress code if you are playing in a special event.